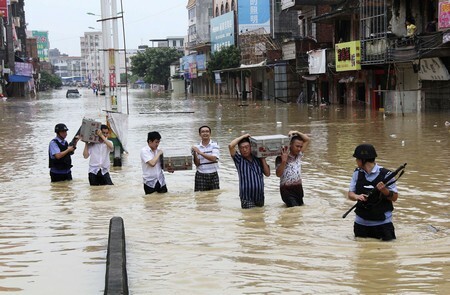 People carrying cash boxes walk across a flooded street as they are escorted by the armed security personnel of a cash-in-transit company after Typhoon Utor hit Maoming, Guangzhou province. 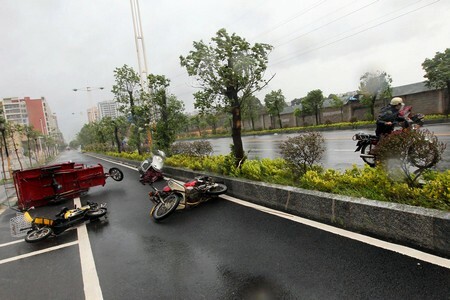 CHINA - At least 20 people are dead and seven are missing across Guangdong province, south China on Monday afternoon after Typhoon Utor slammed into the region with high winds and torrential rain, according to the Guangdong Provincial Department of Water Resources. 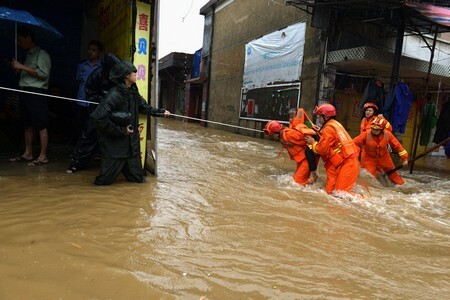 More than 19,000 houses have been destroyed and another 7,000 damaged in 18 cities in Guangdong since Utor swept through western parts of the province on Thursday. So far, Utor has caused 4.9 billion yuan (US$800 million) in direct economic losses and affected approximately 4.16 million people. 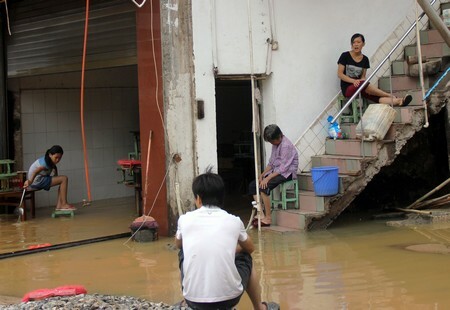 More than 100,000 residents in 22 low-lying villages have been so far relocated, though many villagers were still stranded by noon on Monday. 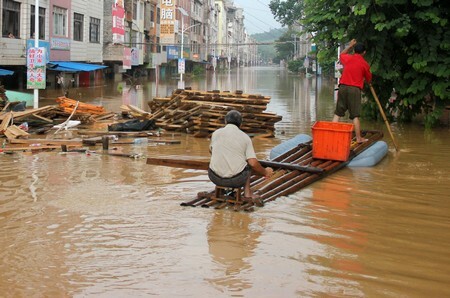 The cities of Heyuan, Zhanjiang, Maoming, Yunfu, Zhuhai, Shenzhen, Meizhou, Shaoguan, Chaozhou, Jieyang, Zhaoqing and Huizhou were hardest hit by Utor, with many houses destroyed or damaged. 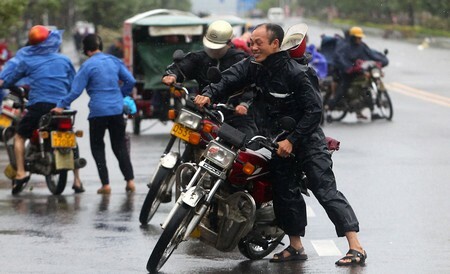 Guangzhou, capital of Guangdong, was also hit hard by the storms over the past two days. 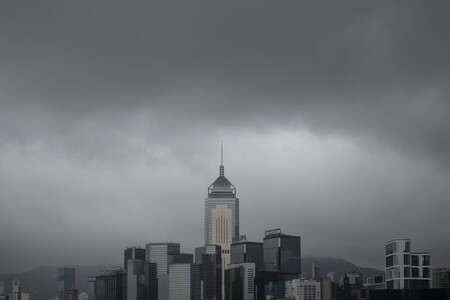 Thousands of passengers have been stranded in Guangzhou Baiyun International Airport since Thursday after flights were cancelled or delayed because of the storms. At Guangzhou Railway Station, partial service resumed on Monday morning after a one-day suspension due to a landslide in the northern part of the province over the weekend. Railway officials said a high number of trains would still have to be cancelled in the coming days. 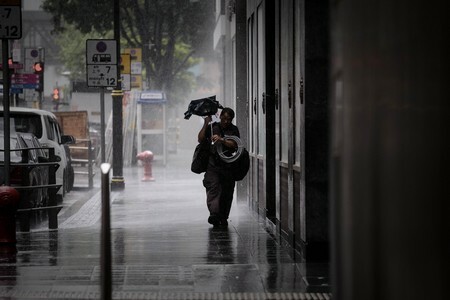 After rail service was halted on Saturday, more than 80,000 passengers were stranded at the station at one point, one of the country's busiest, according to sources with Guangzhou Railway Corp.
A man holds his broken umbrella against heavy winds in Hong Kong on August 13, 2013 as the city braces for deadly Typhoon Utor which earlier swept through the Philippines. 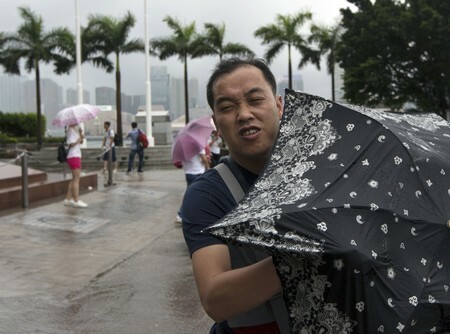 A man braves the wind at the Golden Bauhinia Square as Typhoon Utor approaches Hong Kong August 14, 2013. 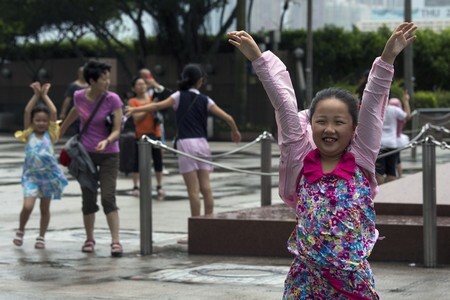 A child plays at the Golden Bauhinia Square as Typhoon Utor approaches Hong Kong August 14, 2013. 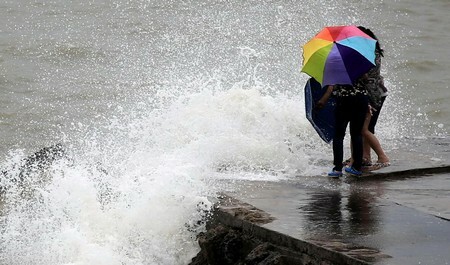 Two women hold an umbrella against waves on the coastline of Haikou, south China's Hainan province, as Typhoon Utor passes over the region on August 14, 2013. 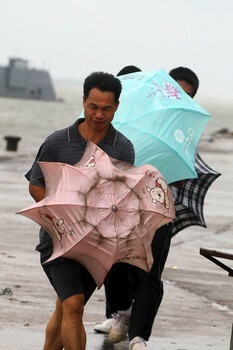 A man standing among collapsed tress after Typhoon Utor landed in Yangjiang, south China's Guangdong province. 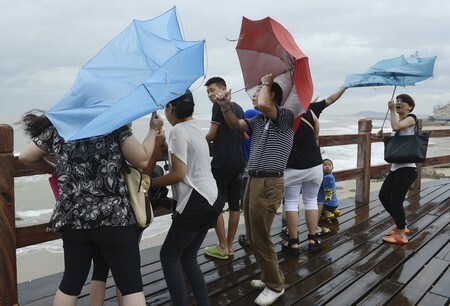 People hold onto their umbrellas as they encounter strong winds near the coast as Typhoon Utor hits Yangjiang, Guangdong province August 14, 2013. 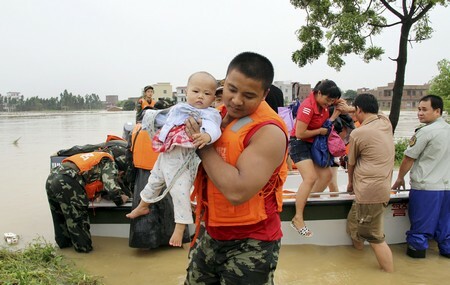 A paramilitary policeman holds a child as he and his comrades rescue residents from a flooded area after Typhoon Utor hit Maoming, Guangzhou province August 15, 2013. 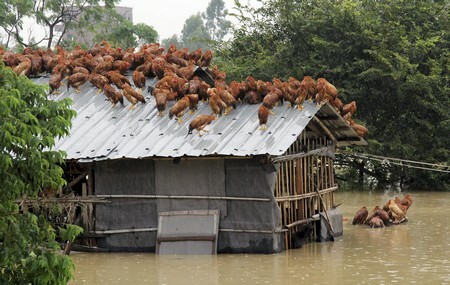 Chickens perch on the roof of a hennery to escape rising floodwaters after Typhoon Utor hit Maoming, Guangzhou province August 15, 2013. 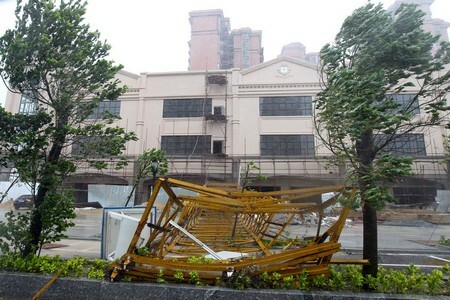 Three people are confirmed dead, five are missing and tens of thousands were evacuated as Typhoon Utor battered south China with strong winds and torrential rain, state media said on August 15. 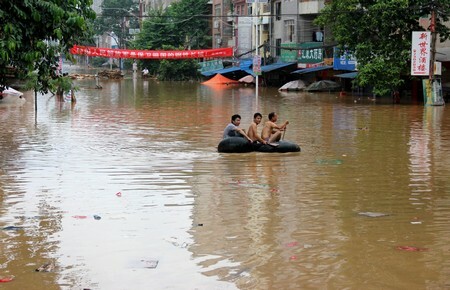 Residents moving through floodwaters in Tengxian county, southwest China's Guangxi province. 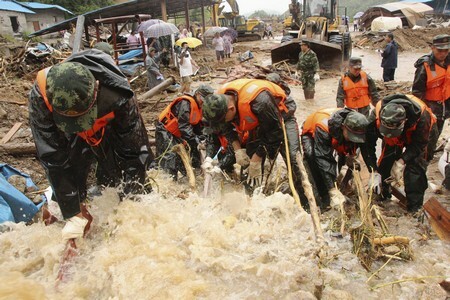 Paramilitary policemen remove garbage to release flood water after Typhoon Utor hit Jiangyong county, Hunan province August 17, 2013. 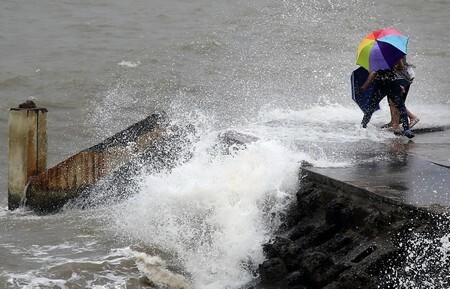 This picture taken on August 14, 2013 shows people walking in strong wind after Typhoon Utor landed in Yangjiang, south China's Guangdong province.